Last spring and summer were pretty annoying for me, a huge Steelers fan. Why? Because I spent the majority of my time arguing with fellow fans about how unsatisfying the end of the 2016 season was, after Pittsburgh got trounced by the Patriots, 36-17, in the AFC Championship Game. For my money, the 2016 campaign was the finishing touches of a masterful rebuild that begin in 2012, only included two playoff-less years and didn’t contain one single losing season. As a matter of fact, I am of the opinion–perhaps naively–that had quarterback Ben Roethlisberger not suffered a torn meniscus right before the regular season match-up against New England, and had star defensive end Cam Heyward not suffered a season ending torn pectoral muscle against the Cowboys in November, Pittsburgh would have finished with a much better record than 11-5 and, at the very least, reached the Super Bowl. OK, so the Steelers didn’t make it to the Super Bowl last year, but, since returning to the postseason in 2014, their playoff trajectory had seen them lose in the wild-card round (2014), the divisional round (2015) and the AFC title game round (2016). Given how superbly talented the 2017 Steelers seemed to be, it only seemed like the next logical step was the Super Bowl. But not before having that AFC title rematch with those nasty Patriots. And, as far as the rest of the country was concerned, the two AFC powerhouses appeared on a postseason collision course from the very moment the 2017 season kicked off on September 7. Both teams did their parts, with matching 13-3 regular season records; when the postseason began, the Patriots had the top seed, and Pittsburgh had the second seed. As you know, unfortunately, the Steelers won’t be joining New England this Sunday in the AFC title game at Gillette Stadium, not after getting their doors mostly blown off in the divisional round by an upstart Jaguars team. 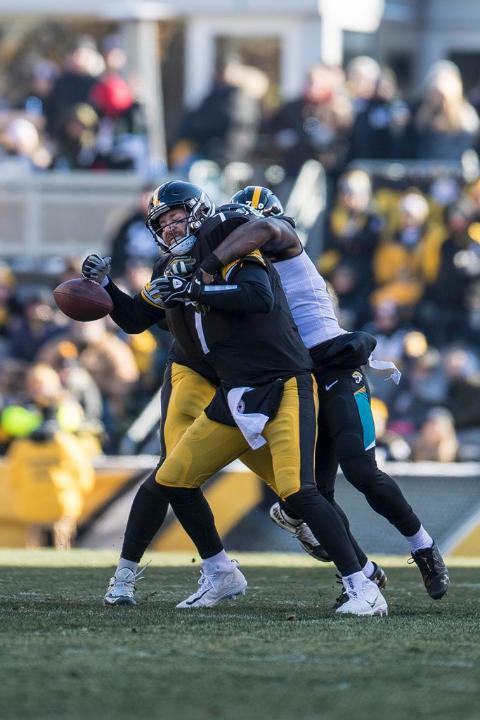 In-fact, in their 45-42 victory that really wasn’t as close as the score appeared, the Jaguars did to the Steelers exactly what they did to them in Week 5, when they came into Heinz Field and had their way in a 30-9, 5 Roethlisberger interception beatdown. Of course, not even the professional bettors, who quickly installed Pittsburgh as a 7.5 point home favorite, thought the Jaguars would be able to do what they did the first time, which was come up with key takeaways and run the ball at will. But after coming up with five interceptions–including two that were returned for scores–and rushing for over 200 yards in the regular season contest, Jacksonville forced two turnovers on Sunday–one leading directly to a touchdown, and the other one setting up a touchdown–and pounded the ball for 164 yards. In-fact, rookie running back Leonard Fournette eclipsed the 100-yard mark a second straight time against Pittsburgh this season, and scored three times, giving him a total of five touchdowns in two games at Heinz Field. The Steelers knew exactly what the Jaguars were going to do, and they let them do it anyway. Yes, you have to give Jacksonville credit, but that doesn’t mean you’re not allowed to be angry at the Steelers. After anticipating a re-match with your biggest foe–the proverbial monkey that’s been sitting on your back since January of 2002, when it walked out of Heinz Field with the first of three AFC titles at your expense–you couldn’t even make it back to the party to see if, just once, you had it in you to shake that thing off. So, yes, I’m still a little miffed about how the Pittsburgh Steelers 2017 season ended, and I don’t blame you if you’re feeling the same way. This entry was posted in Steelers 2017 season and tagged Ben Roethlisberger, Cameron Heyward, Pittsburgh Steelers, Steelers vs. Jaguars, Steelers vs. Patriots. Bookmark the permalink.